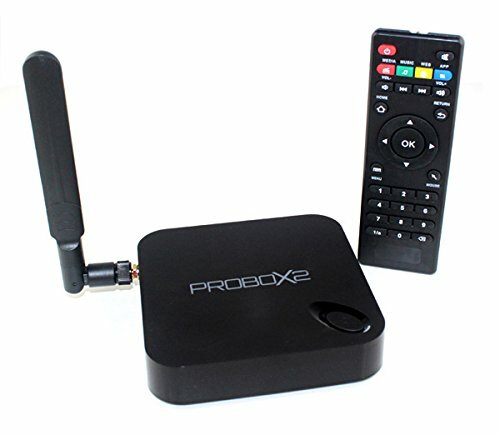 PROBOX2 Remote+: To maximize the best user experience, PROBOX2 EX+ comes bundled with Remote+ under a limited pre-sale period (Worth $28). Remote+ is an unique tailor-made media remote controller with Air mouse function, Gyroscope, Gaming pad, builtin microphone and directional pad for easy navigation in media applications like the Kodi. 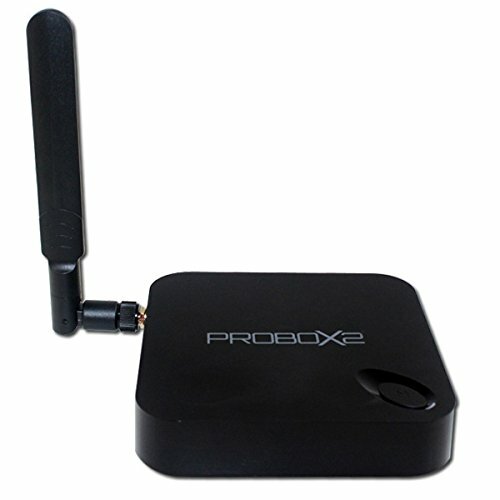 Today we are going to be doing a PROBOX2 EX review. 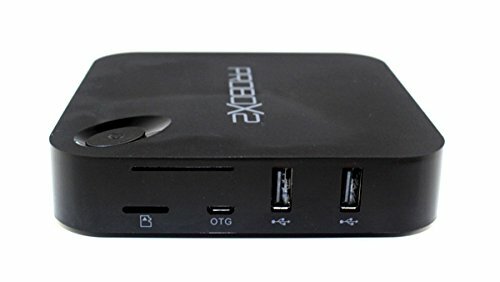 The box features the AM Logic S802 Quad Core Mali 450, with 2GB of DDR3 Ram and 16GB of eMMC Flash storage. 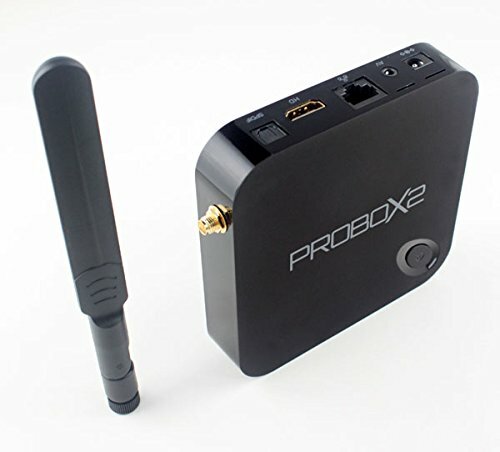 When we open the box we find the PROBOX2 EX, an infrared remote control (unless you pay extra for the wireless remote), a power cord, some RCA and HDMI cables, a user guide and a dual band 5dbi antenna, which is great for boosting Wi-Fi connectivity. If you have the standard infra-red remote, it works ok, but you have to always make sure it’s pointed at the box! 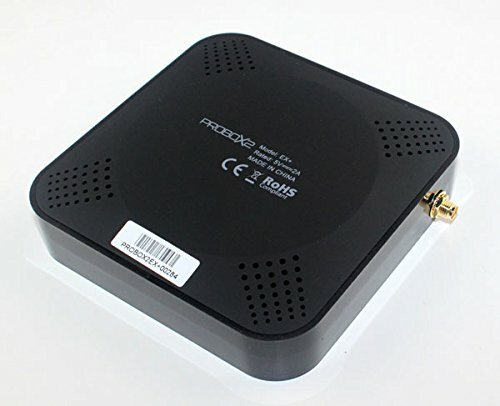 If you opted for the wireless remote to be included (which we highly recommend), you will find this nice device in the box. It is styled like an old school games pad (see pictures above), in black and red plastic. This also allows you to play games pretty easily. It comes with a built in microphone, which is handy for voice searching on Google, or improving call quality on apps like Skype. It is streets ahead of the standard infra-red remote that comes included, and is highly optimized for the PROBOX, so is a must have if you are thinking about buying this box. 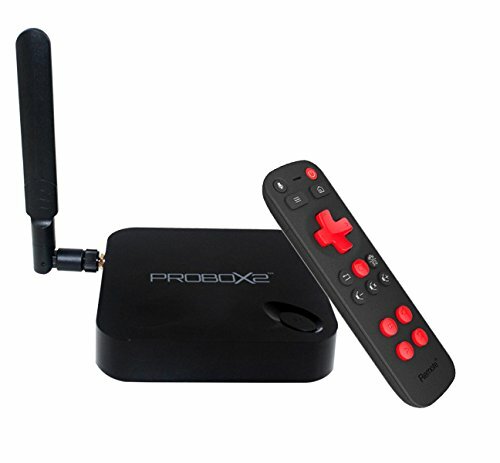 You can check out our review of the PROBOX2 EX remote here. So looking at the box itself, at the front we will find no ports at all, or lights or switches which is great. On the left side we find the SMA antenna, which can be rotated so that your box can fit only any shelf. ON the right we find a microSD slot, and OTG connection and two USB 2.0 ports. At the back we have the power jack, AV output, Ethernet connection and HDMI and Optical outs. On the bottom we find a full rubberised base that will keep the PROBOX steady on any surface, and air vents that assist with the cooling of the device. On the top of the box we find the PROBOX logo, as well as a very well located power button. There is also a light on top that is red when off, and blue when on. When you turn on the PROBOX, you are met with a very user friendly interface. Just install your apps and they are displayed in large format on the screen, like on your mobile. The PROBOX also comes with another cleaner launcher installed in you prefer a more minimalist look. If you don’t like the look of either, you can install any launcher and customize the look the way you want. Speedtest: So in our Wi-Fi speed test, the box clocked 33M/BS of download and 20MB/S of upload. When connected to the Ethernet, it clocked 93MB/s download and 20MB/S upload. Geekbench: On Geekbench we got a Single-Core Score of 522 and a Multi-Core Score of 1216. We tried a number of games, and the overall experience was great! All the games play just fine, although we did have some slight frame dropping on GT Racing 2. But this doesn’t seem to be a hardware problem, it’s a matter of a fix on the firmware or application side to be more optimized for this particular device. Overall, this box provides a good gaming experience. 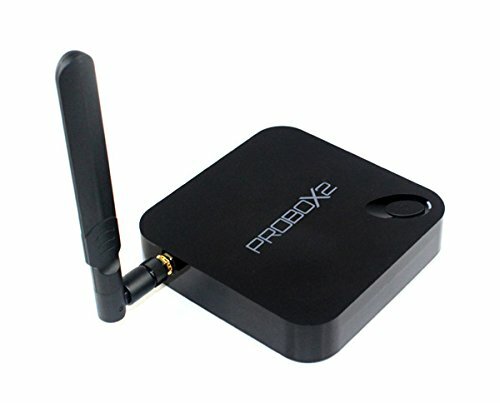 The PROBOX2 comes with XBMC pre-installed which is great, but we also installed the latest version of KODI, and both apps performed perfectly. On 1080p, even with exaggerated fast forwarding and rewinding, the device performs great. On 4k, everything played very smoothly, with no problems whatsoever. We tested out some of the live streams on KODI also, and they performed very well, so if you plan on using your box for streaming live events, you can’t go wrong with this box. 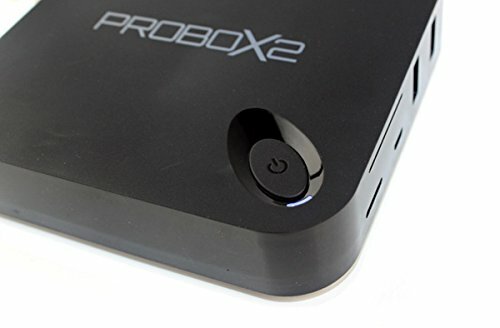 So that’s it for our PROBOX2 EX review, we hope you all found this review helpful, and please be sure to ask any questions or add your own review in the comments. In conclusion, this box is a good all rounder, for someone who wants a step up in quality from the budget boxes. The build quality and performance both warrant the extra expense, and in our opinion it is still good value for money.